Phil Mickelson birdied the fourth playoff hole to beat Tiger Woods in their $9 million made-for-TV match Friday. Mickelson made a 4-foot birdie putt on a specially set up 93-yard, par 3. The match at Shadow Creek Golf Club finished in the dark with lights set up around the hole. 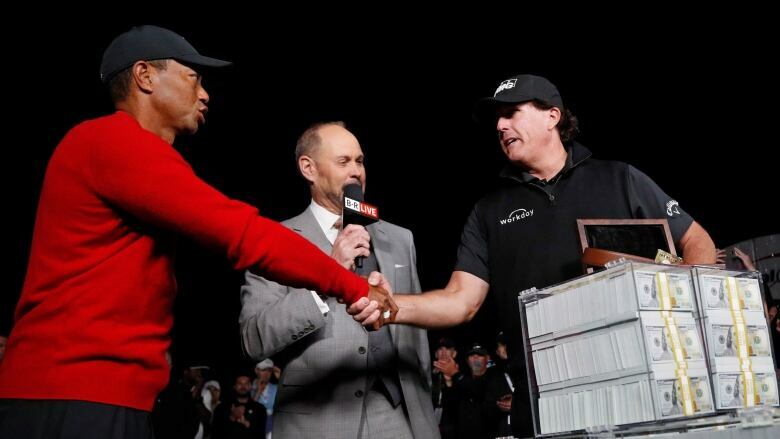 Phil Mickelson beat Tiger Woods in overtime Friday in their $9 million US pay-per-view match in Las Vegas that ended up free for many viewers because of technical problems. There were over 500 people on hold online waiting for assistance at one point. Mickelson also had the advantage in challenge bets. Woods won the first challenge for $200,000 when Mickelson didn't birdie the first hole. Mickelson though won the next three, which were closest-to-the-pin challenges on par-3 holes, which totalled $600,000. "Maybe at match play you could but that might not be the best thing," Mickelson said. "I think it added to the competition. It had that flavour of a Tuesday practice round with more at stake."